KLRU is thrilled to announce a grant of $15,000 from the United Way for Greater Austin that will allow KLRU Educational Services to continue to play an on-the-ground role serving low-income families with young children in Travis County. Several projects will benefit from this infusion of funds, including implementation of the KLRU & UWATX-designed Play to Learn curriculum for families and children ages 2-4. In this 10-week workshop series, adults learn to engage in fun, age-appropriate activities that contribute to school readiness, including smart uses of digital media. 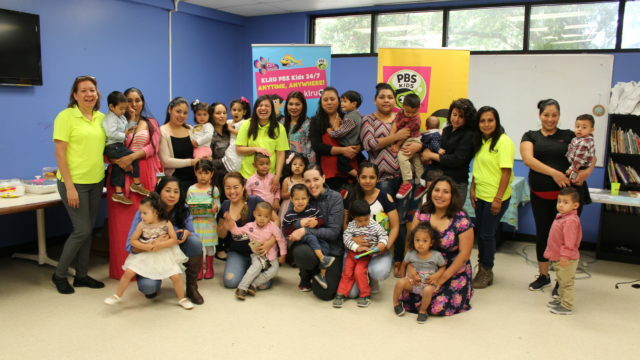 Each week, families take home materials and books for continuing the engagement at home and at the end of the series, each family takes home a PBS KIDS Playtime Pad loaded with educational apps. In addition, the funds will support promotion of Bright By Text, the free local messaging services (in English and Spanish) for parents of kids ages 0-8 that provides tips for raising kids, building school readiness, and accessing local resources. In Travis County, 42 percent of all children under six years of age are living in low-income families. That’s almost 40,000 children who wake up each morning in homes where economic insecurity can force families to choose between paying their ever-rising rent or purchasing groceries. Outreach like Play to Learn and Bright By Text can provide families resources and opportunities that may be hard to acquire on their own. The United Way for Greater Austin Community Investment Grants are made possible by the contributions of thousands of community investors through United Way employee giving campaigns each year. Many volunteer reviewers also gave through their company campaign. For more information on the UWATX, click here.